DC Voltage Multiplier: Module MUL270-000, Industrial DC Signals Mult. A calibrated 100% signal on Input X and on Input Y would nominally produce a full-scale output signal. The multi-turn GAIN and BIAS potentiometers can be used to set the maximum and minimum output levels. Typical output levels are 0-10V, 0-20mA, or 4-20mA. Input Y also has a TRIM RANGE potentiometer that can be used to limit the minimum range of INPUT Y. This functionality is typically used in the dancer trim and torque takeup/letoff applications. An internal jumper allows selection of a voltage or current output. 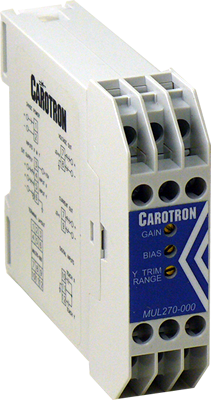 Onboard EEPROM is used to backup and retain the calibration values during a power loss.